Generally speaking, Red Squirrels are not a pest. The Grey Squirrel definitely is, so the following information concentrates on the Grey species. 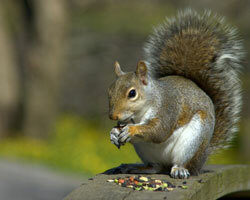 Grey Squirrels will readily inhabit lofts, attics and roof spaces as well as outbuildings. Signs of their presence will be scratching noises and droppings. However, these can be mistaken for rat droppings which a qualified technician will be able to discern. Grey squirrels may pass fleas to domestic animals which can be treated using animal flea treatments – hence the need for squirrel control or squirrel catcher. They are not thought to carry human diseases but can administer a painful bite if they are frightened. Although the Grey Squirrel is attractive, appealing and entertaining, it can be a serious pest in the garden and especially to a bird lover. It is very bold and soon learns to take food from bird tables, chew through peanut feeders (only ever use steel ones to minimise this) and take seeds from tube feeders. In addition and if it isn’t always able to get the food from the feeder, it will seriously damage it and often to the point that the feeder is no longer usable. Squirrels will also damage trees by chewing off bark (which can kill small or young trees). Pestforce will remove your squirrel problem by laying suitable trapping and baiting where appropriate. For your free onsite squirrel control quotation, search for your local Pestforce technician at the top right corner of this page.